Often the things you love as a child or even as a teenager don’t stick with you throughout your life. We move on, we change, we grow, we become an… adult. (?) But these things that shape you as a person, you always think fondly of. It may seem silly but Alice in Wonderland was always one of my biggest influences through my teens. After reading the novel I threw myself into it wholeheartedly and it inspired so many of outfits, purchases and even my way of thinking. It has so many quotable moments that I bring into everyday life even now, that it actually even made me rethink a few weeks ago when I realised, I’d lost my way. 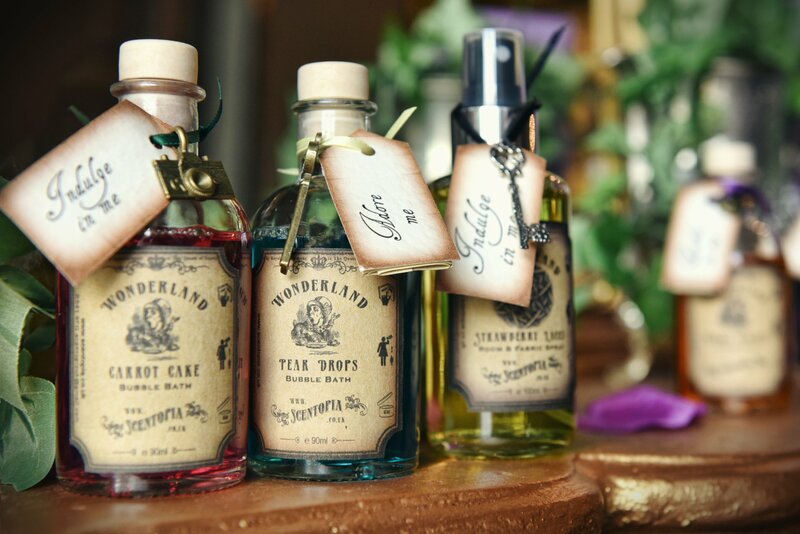 My nostalgic feelings towards Wonderland were instantly triggered when I approached Scentopia at Comic Con earlier this year- an Alice in Wonderland inspired brand that produce scented products. Their stand was incredibly well designed and I instantly fell in love with it. Once I’d purchased one of their room scents (which now makes my car smell of Cherry Bakewell- mmmm) I was absolutely thrilled when they gave me the opportunity to trial their other products. But how do I tell you how lovely the scents are? It’s hard to describe something that smells amazing to me, to all of you. How do you go about it? Smell is such a unique experience for everyone. 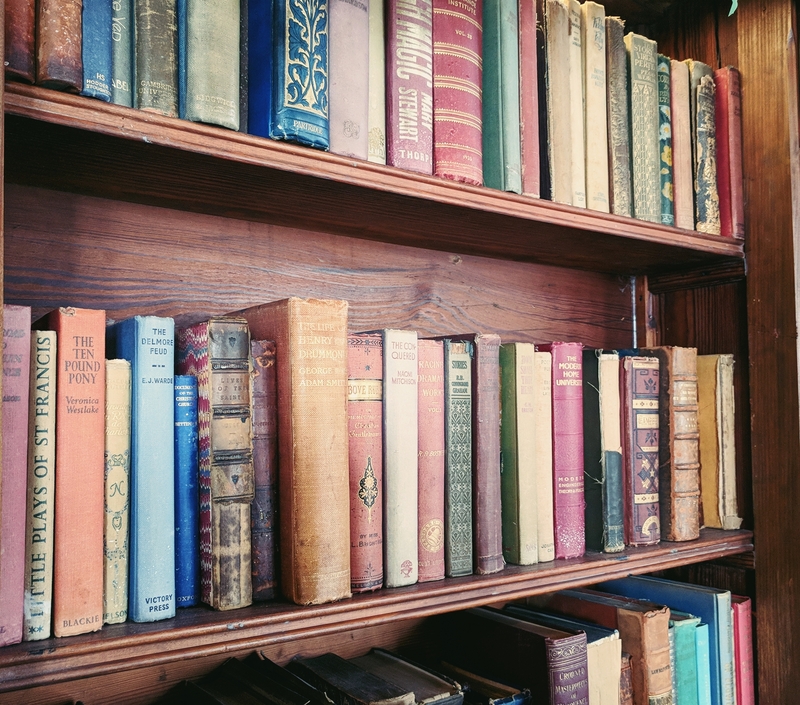 A smell can take you back to your childhood, a time where you felt most elated… It can remind you of a person you love, or a place you’ve been and would have liked to spend forever. Just believe me when I say, they are absolutely delightful. The packaging is stunning and I want to keep all the glass bottles preserved forever on my shelves among my other Alice inspired items I’ve collected over the years. 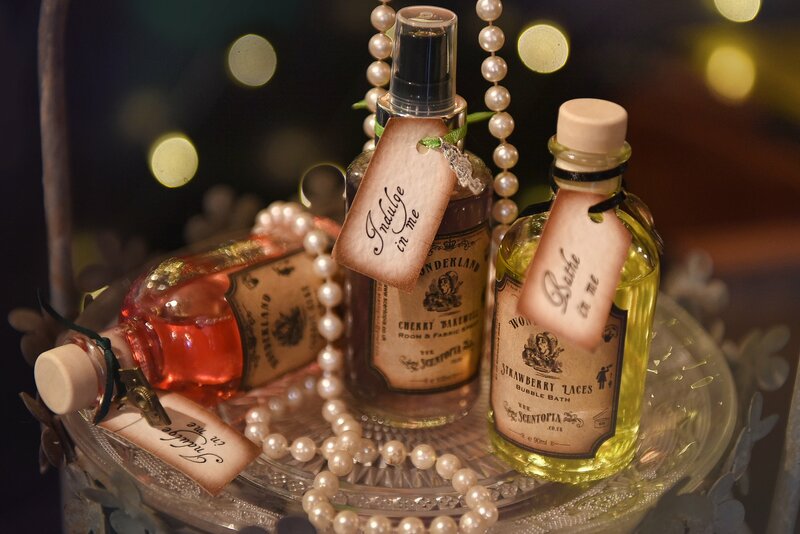 Some say you should use scents to help remind yourself of a specific time in your life. Buy a new perfume to wear for life events so it always takes you back to that day. Last year I dressed up as Princess Bubblegum for Comic con (cosplaying for the first time… eep) and Scentopia’s Bubblegum Cosplay Spray would have fit so well! They encourage you to use their spray every time you cosplay to help bring back fond memories (while not damaging the expensive fabrics). I’ll be sure to use it in future! Last week I spent most of my time relaxing and surrounding myself with these nostalgic smells – speaking specifically swimming in Scentopia bubbles! Bliss. It meant I didn’t have time to write a post last Saturday but, I’m still here… just about. They’re so PRETTY! I love them, and you’ve made me want to try them without actually being able to smell them. Bravo, wordsmith!